Prewired with 14 gauge wire and 1/4" Switchcraft jack. Available in 2x12, 1x12, 2x10, 1x10, and 1x15 fromat. These have 1/2" birch plywood baffles and are test load rated to 70 lbs. per speaker cutout. By comparison, most speakers are only 10 - 20 lbs. Model VS212U. 2 x 12 tweed style cabinet. 29"w x 17-1/2t x 10"deep. 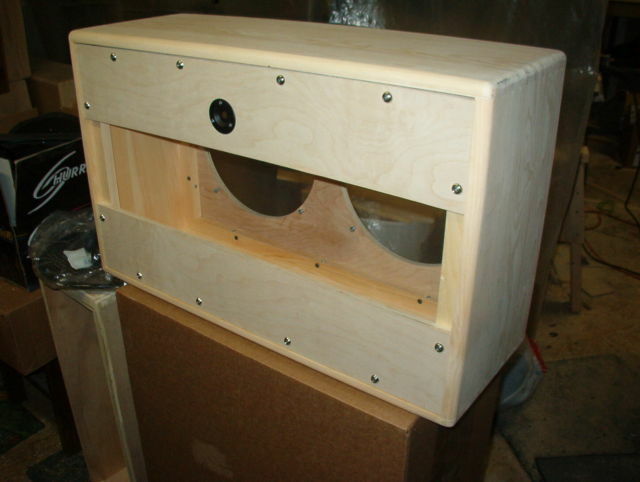 1/2" birch plywood baffle and rear panels. 23 lbs. 3 weeks lead time. Model VS112U. 1 x 12 tweed style cabinet. 20"w x 17-1/2"t x 10"deep. 17 lbs. 3 weeks lead time. Model VS115U. Tweed style 115 cabinet. 20" x 20" x 11" deep. 20 lbs. 3 weeks lead time. Model BS212U. Bluesbreaker style 212 cabinet. 29"w x 20"t x10" deep. 3 piece convertible rear panel. NOTE: Allow 3 weeks build time. Model VS110U. 1 x 10 tweed style cabinet. 18"w x 16"t x 10"deep. 16 lbs. 3 weeks lead time. Model BS112U. Bluesbreaker style 112 cabinet. 20"w x 20"t x10" deep. $154.95 + $35.00 shipping......20 lbs. Allow 20 days build time. Model BS210U. Bluesbreaker style 210 cabinet. 25"w x 18"t x10" deep. Allow 20 days lead time. No grill frame is needed.. The baffles are held in by screws and can be removed. At this time a cloth can be attached to the baffle then reinstall the baffle. 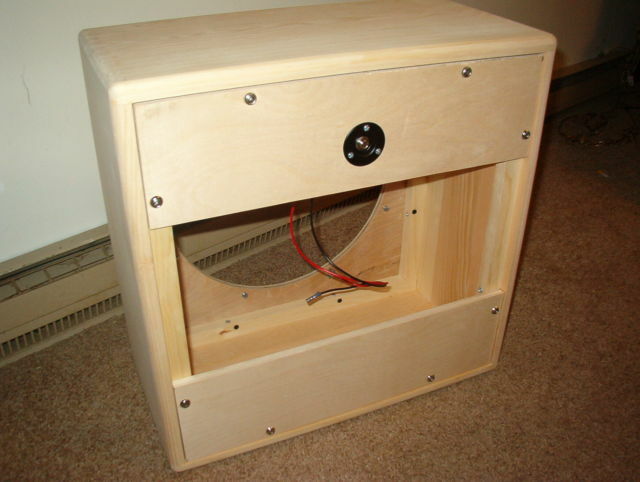 Next you can install your speaker(s) through the rear of the cab (rear loading). This design eliminates extra parts and potential rattle problems..
VS410U. Unfinished vintage tweed style 410 cab . 24" x 24" x 10" d.
Opened back. Also available as a closed back. $229.95 + $50.00 shipping. ...28 lbs. NOTE: Allow 20 days build time. PLEASE NOTE: due to a recent influx of orders there is now a 3 week lead time for unfinished cabs and 4 - 5 weeks for finished cabs. Model VS210U. 2 x 10 tweed style cabinet. 25"w x 16"t x 10"deep. 22 lbs. 3 weeks lead time. oxblood w/gold stripe grill cloth, Fender style molded brown dogbone handle, rubber cab feet. NOTE: Allow 4 - 5 weeks build time. $389.95 FREE U.S. shipping....25 lbs. 2 x 10 version. MODEL # VS210TO. Hand rubbed finish, oxblood w/stripe cloth, brown dogbone handle, rubber cab feet. $389.95 FREE U.S. shipping....24 lbs. Also available in tweed or tolex coverings. Contact me for details and pricing. w/strip grill cloth, brown dogbone handle, and rubber cab feet. MODEL # VS115TO. Same as above but, with hand rubbed finish, oxblood w/stripe grill cloth, brown dogbone handle, and cab feet. $369.95 FREE U.S. shipping.....22 lbs. .Also available in tweed or tolex coverings. Contact me for details and pricing. MODEL BS212TO. Glossy hand rubbed finish with oxblood w/stripe grill cloth, brown dogbone handle, large rubber cab feet. 29" wide x 20" high x 10" deep. dogbone handle, large rubber cab feet. 25"w x 18"h x 10" deep. Glossy hand rubbed version with oxblood w/ stripe grill cloth, handle, rubber feet. MODEL # BS112TO. $319.95 + $35.00 shipping....22 lbs. Glossy hand rubbed poly finish.